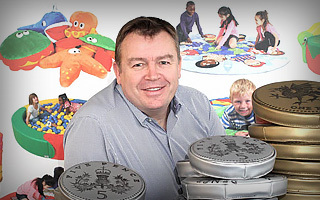 Entrepreneur Jan van der Velde has an infectious enthusiasm; ideal for someone whose business is supplying educational equipment to schools and nurseries. He is also quietly ambitious, although the targets themselves are far from modest. “I want to place Kit for Kids as the leading supplier of educational equipment globally,” Jan states, without a hint of irony. Just for good measure he adds: “We also want to be the world’s leading supplier of cot mattresses.” To be fair to Jan, these are no idle boasts; they are the result of hard work, a strong business strategy and a careful approach to funding his company. Jan started his career as an electronic engineer, designing combat aircraft systems with GEC Avionics, before deciding that financial services might offer a more sustainable future. So, he joined what was then PriceWaterhouse and qualified as a chartered accountant. All was going swimmingly until 1993. “By then I had two kids and one of them was a right tearaway. I started to design play areas to keep them entertained and spotted a gap in the market,” Jan explains. He decided to leave the security of PW and set up his own business with some £30k in personal investment and bank funding, plus a small amount of additional support from the local Business Link. “Our first real customer came from a referral: it was Stoke Mandeville Hospital, who were impressed with our play mats. Soon afterwards we signed Toys ‘R’ Us at the London Toy Fair and the rest is history.” Business grew exponentially, with turnover increasing from just over £100k in the first year to £1m by year four. As turnover grew, so did the Intellectual Property value held within the company. Jan warms to this particular theme: “Over the past four years, the banks have to some extent instilled fear in business leaders which has constrained growth. If you can access funding other than through normal bank lending lines then you can concentrate on longer term strategic goals of the business rather than worrying about short term bank covenants.” If proof was needed, since the initial valuation and additional investment in the business, the company’s IP value has risen by 28% in just four years. Growth is not just visible on the Kit for Kids bottom line, but in its pension fund too. Having partially repayed the initial loan, Jan and directors went back to the pension fund a second time for a further £60k. “It was great, because we didn’t have to go back to the bank to ask for more, we could just re-borrow some of what we’d put back into the pension fund, only this time with complete confidence in what we were doing.” Despite a £60k re-finance, over the four years since the business agreed to use pension-led business funding, the pension scheme has grown from £165k to £210k “That’s a pretty impressive return by anyone’s standards,” says Jan.
Jan van der Velde set up Kit for Kids after spotting a gap in the children’s indoor play area market. His first customer was Stoke Mandeville Hospital and then he signed Toys ‘R’ Us. Within four years turnover rose from £100k to £1m, but the business was underfunded and recession hit just as it needed to improve debt to equity ratios. After an independent intellectual property valuation, a company pension scheme was established based on Jan and his co-directors’ accrued pension assets and the IP was purchased on a sale and lease-back basis. Having partially repayed the initial loan, the directors went back to the pension fund for a further £60k. Kit for Kids has now been awarded a place on the government’s Growth Accelerator Scheme, has a new £250k Middle East Contract and a US office.